Thursday, October 4, 6 p.m.
After decades of under-the-radar success, the Boise State Broncos became a household name during the 2006-07 NCAA football season. That was when the 12-0 Broncos were set to face the 11-2 Oklahoma Sooners in the Fiesta Bowl. A David vs. Goliath event, everyone expected the Sooners, who played in the highly competitive Big 12 conference and had dominated since coach Bob Stoops took over in 1999, to beat the no-names from the Western Athletic Conference. The match-up would end up becoming one of the greatest college football games ever played, with Boise State beating Oklahoma, 43-42, on a trick-play two-point conversion to win in overtime. But where did it all start? How did a school in Idaho become one of the most successful and polarizing schools in the country? 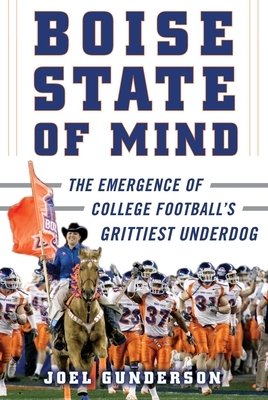 In Boise State of Mind, writer Joel Gunderson tells the story of how the school went from a junior college to Division I, climbing the ranks and building a program that has since beaten such college football powerhouses as Oregon, Georgia, Virginia Tech, and Oklahoma, and has the highest winning percentage in the country since 2000. With in-depth interviews with current and former players, coaches, and administration, Gunderson offers an entertaining story of the growth of a program that rose from anonymity to becoming arguably the most successful underdog in the country. While the city of Boise in Idaho has a population of approximately 223,000 people, the state, in general, is not a sports powerhouse. The closest NFL team is the Seattle Seahawks, who are a 7.5-hour drive away. There are currently only six players in the NFL that were born in Idaho. So how did Boise State, known mostly for its blue turf, become known for football excellence? This is more than a Cinderella story. It's about how they arrived, how they conquered, and how they've maintained in the cut-throat business that is college football. Joel Gunderson is a freelance writer whose work has appeared on The Athletic, The Cauldron at Sports Illustrated, NBC Sports Northwest, the San Jose Mercury News, and the Pac-12 Network. He is a former finalist for the ONPA Sports Feature of the Year Award. Joel currently lives in Portland, Oregon, with his wife and three kids.